Agent Ritchie: Who's Eric Rawdon? Agent Ritchie: Maybe he's your partner. Hotch: If that were true, you'd have evidence. Hotch: You're grasping. And I'll tell you why. You need me here as cover for missing a major terrorist incident. Agent Ritchie: It's a prison break. Hotch: Not to Rawdon. His dream has always been to set off a bomb In a major metropolitan area. Not for any political or ideological reason. He just wants to see a city burn. And you're letting it happen. Agent Ritchie: Now you're grasping. Hotch: Am I? Ask yourself one question. Am I more helpful here, mentally preparing the report to the sub-committee that's going to haul you in? Or out there, catching Rowdon? 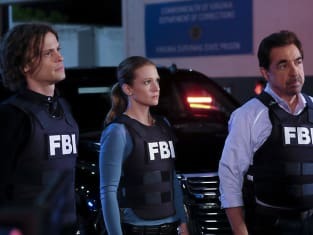 Criminal Minds Season 11 Episode 22: "The Storm"
Rossi: Do me just one favor. Before you make any decision, meet my team. They're the only family I have outside of you and Joy. I walked away thirty years ago. I'm not walking away this time. Please. Stay. Hayden: One one condition. That we call our daughter back, together. Permalink: One one condition. That we call our daughter back, together.